Let’s cut to the chase. There are 6 key things to watch this week. The EU summit is likely the big one. This is the event with the most market moving potential for the coming week, hands down. As with the FOMC meeting last week, it’s what markets are pinning their hopes to. Whether markets rally or fall in the days prior to it will depend greatly on whether they’re optimistic or pessimistic about the results they need to see, discussed below. EU leaders behave radically differently than they have in the past, present a concrete, detailed plan that actually addresses the root causes of the EU sovereign debt and banking crisis. If so, expect a significant rally in risk assets and risk currencies. Anything connected to the EU, like EU stocks and the EUR would be big short term winners, the USD and safe haven assets big losers. EU leaders behave as they normally do, and fail to do the above, with opposite results in the markets. Given the stakes and the depleted credibility of EU leaders, they are almost out of time before either a Greek default or direct speculative attack on Spain or Italy (both too big to rescue) bring Spain or Italy to default, and marks the end of the EU as we know it. Again, Greece is relevant only to the extent that its default risks default of Spain or Italy, both of which are too big to rescue. Ignore all the verbiage written about it this far. Given the stakes involved, EU leaders and the mainstream media cheerleaders will try to convince you that the Summit was a smashing success and now there’s hope. To save us all a lot of reading time and confusion, here’s all you really need to know about what this much anticipated summit must actually accomplish. As discussed in our other weekly post, PRIOR WEEK MARKET MOVERS, ANALYSIS & LESSONS: WHY EU REALLY IS DOOMED (see the LESSONS & RAMIFICATIONS SECTION) the EU as we know is finished unless certain radical changes occur. These are unlikely to occur at all, and are even less likely to occur before Spain or Italy is rendered insolvent and there is no funding ready to keep them from insolvency and from igniting a bigger version of what happened after Lehman brothers crashed. that would be enough to buy time and probably spark the above mentioned rally. Therefore we judge the EU summit based on whether it produces convincing evidence of the following changes coming WITH key details and funding already clarified. In essence we need to see a detailed plan to guarantee all bank deposits against loss from both bank default and redenomination risk if a given nation reverts to its old national currency. Obviously the funding nations would not agree to take on such a huge financial commitment without the likelihood of both repayment and a similar crisis not occurring again. That means…. EU banking regulation and oversight, complete with the ECB authorized to print money as needed to guarantee banking system integrity and prevent fatal bank runs. Convincing evidence that EU member nations are ready to cede this power of budgets, banks, and any related powers (like judicial systems that can enforce relevant legal powers) effectively exchanging full national sovereignty for a stable currency union. That would leave them with no more effective sovereignty than individual American states. 4. A clear plan of how to provide stopgap funding to support GIIPS and other sovereign bonds and bank deposits while the EU of Europe is being finalized. This is probably the key provision. If the EU can print Euros as needed to guarantee the banking system, and prevent bank runs and a collapse of this system, that might buy the EU enough time without speculative attacks on Spain and Italy to organize and ratify enough of a US of Europe to keep alive without a default that brings a fatal banking collapse. I might be missing an item or two, but the idea is clearly enough of a political union that can enforce payment of member debts and sustainable budgets. Funding details: who pays, how much, how they’ll have the money (would you trust a commitment from Portugal or Spain? ), when they must have the cash in. Enforcement details. If one or more member states fail to pay up, who funds shortfalls and how does the EU enforce payment or penalties. These must include provisions for both administrative and if needed, military takeover. These must also include provisions for a well funded regulatory body that has the means and sophistication to monitor compliance. This is critical given that some of the GIIPs suffer from cultures of deep corruption and socially acceptable tax evasion. How each state will ensure timely ratification of their agreement, and if they don’t, how the remaining EU can continue to function, make up the funding shortfall, and ensure that contracts and other financial and other commitments of that nation and its citizens remain enforceable. The above funding plans DO NOT INCLUDE significant amounts of more debt created. The cause of EU liquidity issues are insolvency from excessive debt. That means abandoning the Planet Ponzi economics that caused the current crisis. Is it realistic that the EU can come up with all that so fast? No, it’s not, though they might by time if they can agree to print money as needed for guaranteeing bank deposits and preventing banking collapses. Will funding nations agree to take those risks in the interim, or allow the EUR to be printed in quantity? How many of these proud, ancient nations will really be willing to place their fate in the hands of a collective group that often includes nations that some see as historic enemies, unreformed conquerors, or incurably corrupt or irresponsible? Given that it took the US nearly a century and a civil war to accomplish the above, it seems unlikely the EU can expect to overcome far greater cultural, linguistic, and nationalistic barriers in a matter of a few years. June 29: Germany’s Bundestag to vote on EU fiscal compact and permanent rescue fund (ESM). A 2/3rd majority is needed. Merkel needs opposition support, so this could come down to some surprisingly mundane political horse trading. Stranger things have happened. The early Israel-Palestinian agreement passed the Israeli Parliament by one vote, bought by the Rabin government from a corrupt opposition Parliamentarian in exchange for a Subaru sedan. Monday June 25: Spain expected to formally request bank rescue, complete with a memorandum of understanding with key terms, set for July 9th. Spain is rumored to be considering imposing losses on junior bank bondholders, which would likely cause Spanish and other bank borrowing costs to rise as they would now be deemed riskier as other GIIPS bank bond holders anticipate similar treatment. Note that last week Fitch said that Spain’s auditor Wyman and Berger, had underestimated bank funding needs. The bailout solves little besides buying Spain some time, but any hitches in that deal could raise fears of an imminent Spain banking crisis as seen in prior weeks. On Friday June 29 Italy has a critical auction of benchmark 10 year notes. A successful auction goes a long way to calming markets about Italy; a failed auction will quickly accomplish the opposite. Given the stakes, expect the EU and ECB to quietly do what they can, especially if the EU summit fails to produce meaningful progress. A disappointing summit and Italian bond sale on the last trading day of the week would encourage a confidence shaking pre-weekend selloff the EU would prefer to avoid. Risk assets like the bellwether S&P 500 index remain near 7 week resistance despite this week’s pullback, making them vulnerable to further pullbacks on negative news. Other than the above events, we’ve a typical late month calendar that’s light on potential market moving events. US new home sales, S&P/Case Shiller housing index, CB consumer confidence, durable goods and pending home sales from Monday to Wednesday might be market moving as traders anticipate the EU summit and Italian bond sales Thursday and Friday. Consult any good economic calendar like that of forexfactory.com for details and other events. The week’s big events are loaded into Thursday and Friday, and speculation about them could easily override the influence of earlier week events. Further USD gains as the EUR continues to weaken. General continued weakness in risk assets and currencies, especially given that many (like the AUDJPY) have had multi-week rallies fed by vain hopes for imminent stimulus. While oil and gold remain depressed we hesitate to take positions but remain bullish on both over the longer term, but for different reasons. Gold: Odds favor continued easing from the central banks of the most widely held currencies. While markets remains scared and deflation threats in focus, gold isn’t going anywhere. But when the printing starts in earnest, gold could move quickly, as its June 1st rally showed when there were hints of coming US stimulus from the poor monthly US jobs data. Oil: Long term supply/demand favors a significant rebound in oil prices. We are at typical peak EU crisis fear bottoms, and not far from the deep crisis $70 range that is likely to tempt many to start building positions. As we enter summer season, here’s some recommended reading for becoming a better investor or trader. All are engaging, well written, enjoyable reads that will make you a far more informed investor. This Time It’s Different: Eight Centuries of Financial Folly, Reinhart and Rogoff. The modern classic on the history and nature of debt crises. Endgame: The End of the Debt Supercycle and How It Changes Everything: Mauldin & Tepper. The best selling guide to the Current Great Financial Crisis from an academic perspective. Planet Ponzi: How Politicians and Bankers Stole Your Future, Mitch Feierstein. While the other two are from academics and financial writers, this very recently published work is from an actual insider, a hedge fund manager and CEO with 30 years on both Wall Street AND ‘The City” of London. Equally well documented and well written, this one provides a far better perspective of how the crisis evolved and the mentality and interactions of the 1% and those charged with regulating them. In any given chapter I’ve been alternately shocked, scared, and bent over with laughter. Grasp these and you’ve an excellent understanding of what’s gone wrong. For an understanding of what to actually do to survive and prosper without unnecessary risk or work, there’s only one book that provides a full range of solutions to one of the least understood, most common, and fatal investor mistakes, failure to hedge currency risk. Even those who are otherwise well diversified remain almost totally denominated in their local currency. This is foolhardy for anyone based in US dollars, Euros, Yen, or British pounds, among other currencies. 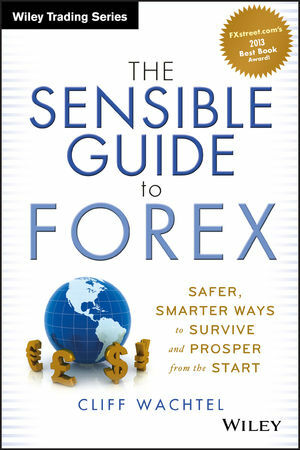 That book is THE SENSIBLE GUIDE TO FOREX, SAFER, SMARTER WAYS to SURVIVE and PROSPER from the Start. See here for a full description, and here for advanced reviews.